(2015 A Thousand Words Contest) Beetle and Willow disagree about the nearby human tribes. Hints of sunset still kissed the wisps of low clouds that were gathering on the western horizon. It was still early, but Beetle was too excited to sleep. Along toward morning, she and the other word-hunters would be leaving the Holt and heading to where the Painted Faces and Amber Hunters lived. It would be the first trip taken in countless waxing and waning of the moons. No group had set out since the Fierce Ones had stepped back into the elves' territory. But now the Fierce Ones were gone. It was finally time to again gather the evidence she needed to prove that not all humans were vicious and cruel. 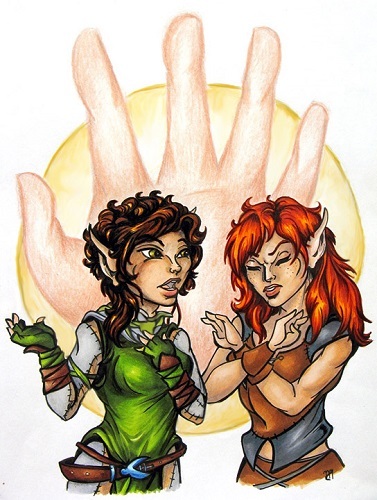 The elves could become friends with the Amber Hunters and the Painted Faces. Beetle just knew it. Beetle sniffed the air. It would rain sometime in the near future, Beetle told herself. Without a thought, she grabbed a waterproof, hooded poncho from her pile of leathers and stuffed that into her travel pack alongside some other necessities she thought she would need for the trip. She looked over her other belongings, trying to decide if there was anything else she needed to bring. Willow's scent reached Beetle's nose before her lovemate's shadow fell across the interior of the room. Willow said nothing as she entered. She merely watched as Beetle put a small leather pouch into her pack. Beetle decided she wasn't going to say anything either, and she continued packing in silence. Not surprisingly, it was Willow who spoke first. Beetle sighed. She stopped packing and stared down at her bag. �What if something happens to you?� Willow's face was all worry and concern. Beetle didn't like seeing that. Beetle felt the hurt well up. It was one thing for Willow not to agree with her; it was another for her lovemate to resort to calling something silly that she believed in so vehemently. Even so, the word came out more sharply than Beetle had intended. Willow's expression melted into one of shock... and hurt. In the past, Beetle would have changed her mind then and there. And � Beetle was almost tempted to change her mind about leaving now, but she quickly forced any thoughts of that away. She had to prove she was right about these humans, and she would! Then, she walked past Willow and made her way out of her den's door and into the waiting evening.